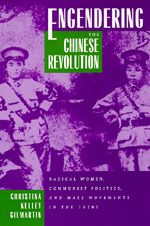 Christina Kelley Gilmartin rewrites the history of gender politics in the 1920s with this compelling assessment of the impact of feminist ideals on the Chinese Communist Party during its formative years. For the first time, Gilmartin reveals the extent to which revolutionaries in the 1920s were committed to women's emancipation and the radical political efforts that were made to overcome women's subordination and to transform gender relations. Women activists whose experiences and achievements have been previously ignored are brought to life in this study, which illustrates how the Party functioned not only as a political organization but as a subculture for women as well. We learn about the intersection of the personal and political lives of male communists and how this affected their beliefs about women's emancipation. Gilmartin depicts with thorough and incisive scholarship how the Party formulated an ideological challenge to traditional gender relations while it also preserved aspects of those relationships in its organization. Christina Kelley Gilmartin is Assistant Professor of History at Northeastern University. She is the coeditor of Engendering China: Women, Culture, and the State (1994).